The 7th Regional Canon Conference titled, “Towards an Ecclesiastical Canon Culture in Marriage” kicked off Wednesday, July 18, off the Dead Sea. The conference is held in cooperation with the Pontifical University of Lateran in Rome as well the Latin ecclesiastical courts in both Jerusalem and Amman. Fr. Emile Salayta opened the conference by welcoming the participating ecclesiastical lawyers from Jordan, Palestine, Iraq, Lebanon, Syria, Iraq, and Egypt. Representing the Ecclesiastical court in Jordan, Fr. Shawki Batrian said that the importance of the family is increasing rapidly owing to the wars and the forcible displacements taking place in the world which lead to the fragmentation of families. He also called for educating people on the values of marriage which include mutual respect. The Latin Patriarchal Vicar for Jordan Bishop William Shomali delivered an address on behalf of Most Rev. Archbishop Pierbattista Pizzaballa, Apostolic Administrator of the Latin Patriarchate of Jerusalem. He said: “Marital problems are on the rise. This is revealed in increased demands for separation or nullification of marriage because couples can no longer live under the same roof of love”. He stressed the importance of making advance preparations by those wishing to get married, pointing out that the courses organized by the ecclesiastical courts in Jordan enable those to be married to make serious preparations and be acquainted with the fact that with marriage they make mutual commitment to live according to a sacrament. Apostolic Nuncio to Jordan Archbishop Alberto Ortega Martín Archbishop addressed the Church’s education regarding marriage, pointing out that His Holiness Pope Francis pays great attention to the family and repeatedly discusses this issue. He pointed out that the Church welcomes those suffering from marital problems and calls on them to reconcile differences so as to resume their procession on the route of love. The conference will last until Sunday, July 22, with Holy Mass and presentation of certificates to the participants. 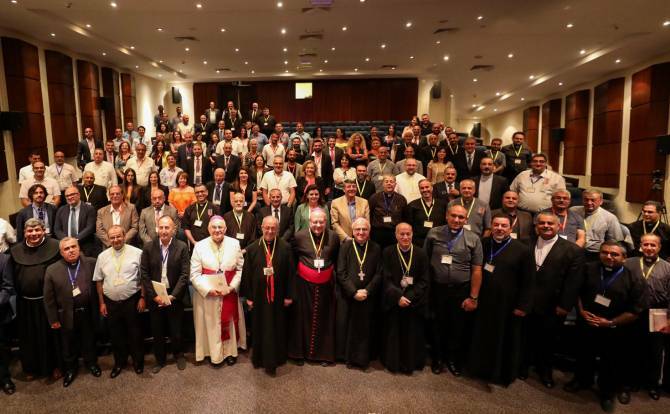 A specialized workshop opened at the Dead Sea on Monday, July 16 and was attended by a number of bishops and priests from Jordan and Arab countries. In attendance was Palestine Ambassador to Holy See Issa Kassisieh.